Fast-talking divorced attorney Fletcher Reede, missing his son's 5th birthday party, finds that his son's wish has been granted: Fletcher is unable to tell an untruth (and truths awkwardly revealed) for an entire 24 hour period. This poses tremendous problems to someone whose occupation is lawyering, particularly in the courtroom. 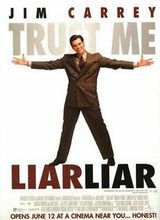 Corny premise saved by Jim Carrey's over-the-top physical slapstick, though it wears thin at times.